Can Ohio State stay in the running for the College Football Playoff in a road game against Michigan State? The 11th week of the college football season has many questions. Journalists/wannabe college football insiders Mark Bergin, Lara Saavedra and Eric Heubusch try to answer some of them. What’s your tweet-length reaction to Week 10 of the college football season? Mark Bergin: Alabama is still undefeated this season against the first-half spread. Lara Saavedra: Big 12 conference games are more entertaining than SEC games. Anyone who missed the back and forth of both West Virginia-Texas and Oklahoma-Texas Tech, you missed out. The SEC games last week were predictable and uneventful except Mizzou’s win at the Swamp. Eric Heubusch: Even after a big win over the Texas Longhorns, West Virginia is gearing up to be disappointed about getting left out of the College Football Playoff. Which Week 11 game are you most looking forward to? Bergin: No. 10 Ohio State at No. 18 Michigan State: A Buckeyes' loss likely knocks them out of the running for the College Football Playoff. 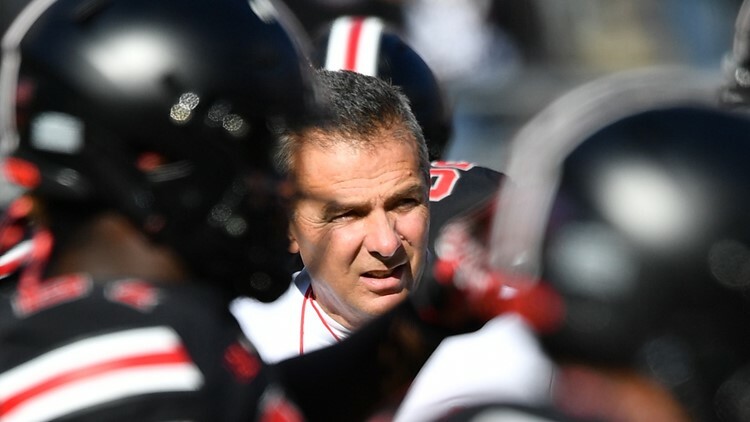 There are rumors about head coach Urban Meyer's future at Ohio State. The Buckeyes are 0-5 against the spread in their last five games. Ohio State barely survived against Nebraska – a team with a 2-7 record this season – last weekend. However, if Ohio State wins the next two weeks, it sets up for an epic showdown against Michigan on Nov. 24. The Wolverines should roll over Rutgers and Indiana in their next two games. Saavedra: Oklahoma State at No. 6 Oklahoma: Bedlam is one of the greatest most underrated rivalries in college athletics. The vitriol and contempt both sides have for one another can’t be matched. Also, someone should tell Mike Gundy he needs a haircut. Heubusch: No. 3 Notre Dame versus Florida State. How big of a blowout does it have to be for Willie Taggart to get fired? Which teams will make the College Football Playoff? ESPN’s College GameDay heads to Chestnut, Massachusetts, as the No. 17 Boston College Eagles host the No. 2 Clemson Tigers. Which team will Lee Corso pick? Bergin: Corso will again don the tiger head with crazy eyes. Saavedra: It’s gonna be a blowout – Clemson covers the 20-point spread and then some. Corso picks Clemson and puts on the scary tiger head. I hope your kids don’t get nightmares. What will Sunday’s headline be? Bergin: Alabama covers 14.5-point first-half spread against Mississippi State, improves to 10-0 against first-half spreads this season. Saavedra: Notre Dame could be vulnerable without starting quarterback Ian Book. It could impact the Irish’s playoff hopes. Heubusch: Another election year will come before Alabama loses. Note: The College Football Playoff rankings are used for the team rankings throughout this story. Eric Heubusch is a researcher with 10News WTSP. Follow him on Twitter or email him at eheubusch@wtsp.com. He is a graduate of the University of Florida.